Rich Christian, Poor Christian: How Can I Become More Productive? I'm currently in a life situation where I'm feeling somewhat productive, but I'm also feeling overwhelmed by the mundane activities of life that are draining me of energy as well as time to unwind and relax. I know that I can become more productive by making some small changes going forward. Scheduling a regular sabbath day. I'm beginning to learn that sometimes just stopping activity for a period of time will boost your overall output. At the end of the last two weeks, I have been running on empty. I have been so exhausted that I really had no desire to do much of anything. Normally on my days off, I would schedule work at home to be accomplished, but no longer. I'm beginning to see the benefits of taking a solid 24 hour period of time to stop all work activity to give my body, mind, and spirit enough time to recover. Get it on your calendar. Stop all work activity in order to be refreshed and renewed. In the last few weeks, I have discovered that the day after taking a Sabbath day, I am way more productive in one day than if I struggled through working two days in a row. Taking advantage of vacation days. At the end of each year, do you typically have a bunch of vacation time that you have not used? Your employer has given you this vacation time as a part of your compensation package. This is considered time off for financial remuneration. This is a fringe benefit that you are given in order to renew yourself so that you can be even more productive in your work. I'm currently taking a day off here and there for the remainder of 2009 in order to get my life in balance, as well as to make time for financial health days and Sabbath days. You will never get reimbursed financially for these vacation days, so you better just go ahead and use them! Using a whiteboard. 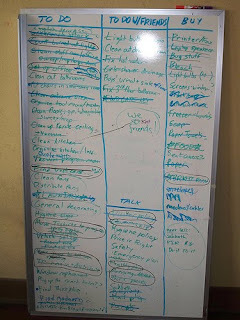 I have found that having a whiteboard at home is extremely useful in getting key tasks in front of my eyes so that I will complete what I need to accomplish. Utilizing a Powerlist. Every day at work, I use a Powerlist that helps keep me focused on my most important work priorities. If you would like a copy of my list that you can tailor for your own needs, just shoot me an email at larryjones.biz@gmail.com. Taking time to sharpen the saw. In Stephen Covey's groundbreaking book The 7 Habits of Highly Effective People, he mentions that Habit 7 is "Sharpen the Saw." Taking a Sabbath day can be included in with this area, but so can reading, writing, planning, meditation, exercise, proper diet, and so on. It's difficult to be as effective as you could be if you are not taking the time to learn and grow. Lean on people that have offered to help. I have found during difficult circumstances that members of the body of Christ have come alongside me and offered me assistance as I need it. The American way is to become a "silo" and completely self-reliant. We all have challenges and need help from time to time. Allow others to help you when you are in need. Changing my mindset to "it's good enough for now." I'll admit it. I'm a perfectionist. It's easy for me to delay completing a project or take action because everything is not "perfect." Over time, I'm learning that sometimes your best in the moment will need to be good enough for today. I can make changes and corrections if needed at a later time. Get things done and move on to the next. Don't get paralyzed by perfection and inaction. Considering outsourcing. If you have the financial resources to do so, hire help. Start with something small, such as hiring someone to come in and clean your home once a month, or cutting your grass once a week. This can save you considerable time and energy, boosting your overall productivity. What techniques have you found useful in boosting your own productivity?